Summer days seem so far away at the moment, especially with the dreary Winter weather setting in. For someone who loves cold weather, I'm really struggling this season with the Winter chills, however I've found the best way to combat these feelings is just to dream of a warm Spring day (not too hot, not too cold) and think of all the amazing Winter themed makeup looks I can create. I know, it's completely nerdy of me but I'm a makeup lover and sometimes I just can't help myself! Lately I have been favouring a brown smoky eye, and it's so easy to achieve this look with minimal effort using an eyeshadow crayon and blending that out with a brush or fingers. It's literally a look that can take you from drab to glam in under a minute, helping you get in those extra minutes of precious sleep. 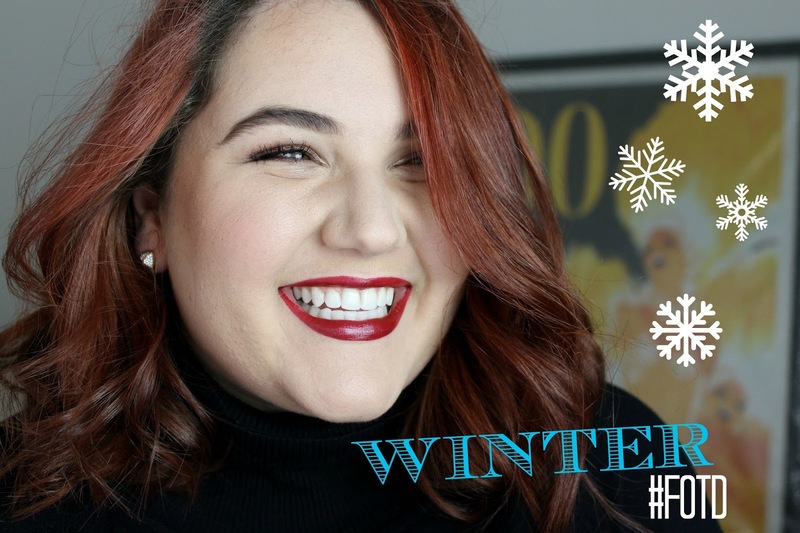 Although I am bringing you a Winter themed Face of The Day, I do like to cater to all my readers and that's why I have teamed up with the gorgeous Ela who will be my Summer FOTD counterpart. I'm also totally loving a red/wine lip this Winter and this Rimmel Provocalips colour has been my absolute go to for both colour and staying power! This post is another collaboration from my #CollabmasInJuly series with the the gorgeous Ela from Ela BellaWorld, please go on over to her blog now and check out her opposing Summer Makeup Look. #CollabmasInJuly is the series that will be featured here on my blog and over on my YouTube Channel, AnjeliqueTV for the entire month of July! This looks is adorable and can easily be transitioned to a summer look with just a slightly lighter lip. That color also looks so good on you, I can't pull of deep reds to save my soul. Thank you Trecee, you're so sweet! Gorgeous make-up look! I'm loving that deep red lipstick. I'm loving this bold lip color! It's been my absolute go to over the last few weeks! Such a pretty look, and one of my favorites throughout the year: Brown smokey eye and a red lip. Initially I thought that was Kate Rimmel 107 but it's Provocalips? I only have one from the range I think the name starts with Berry...and I love it, it really doesn't budge! Love the look, Anjelique, this is another great collab. I agree Shireen, it looks so similar to 107 and the Provocalips formula is fantastic! Awww thank you so much for coming over- you are too sweet! Such a gorgeous winter makeup look, Anjelique! I am looking forward to wearing my berry lipsticks again once the weather starts to get colder! Wine&browny makeup combination looks beautiful, I will definitely be trying that! Thank you so much for working with me Ela! Minutes ago I saw summer look of Ela! Yours is absolutely amazing too! You are such a stunner! Love your winter look! Thanks you so much Cvetina, you're so sweet! Thank you so much Madison, you're always too sweet! Love the colours, great work and photos!